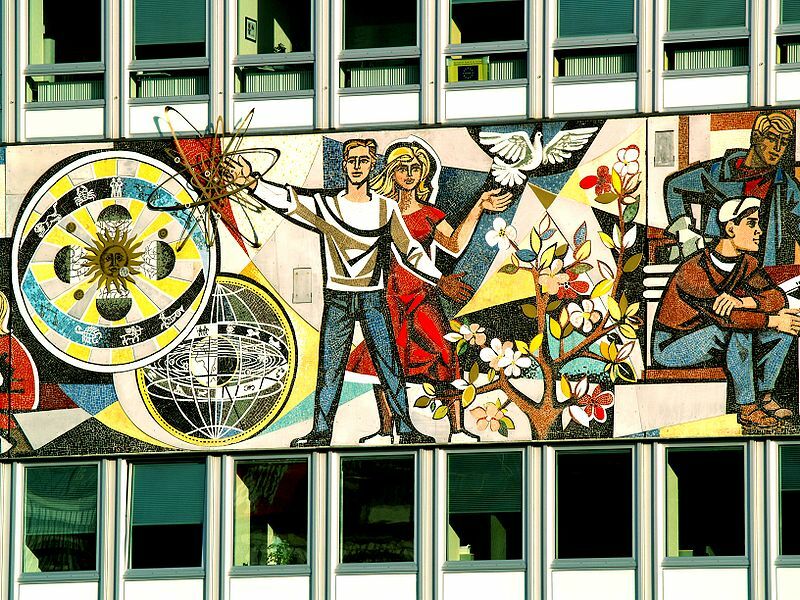 Socialist artwork on display in what was formerly East Berlin. Image courtesy of Wikimedia. The aspiration among the emerging generation today to participate in creating a socialist society should not be understood as a desire to replace one system called capitalism with another system called socialism. That very way of thinking—in which the human person is imagined to be a cog in one or another system—is what young people are trying with all their spirited energy to throw out the window. The very idea that there is something called a “system” that exists outside of us and that we are “in” is actually part of what this rising generation is rejecting. Instead they are aspiring to create a new space of existence in which the passivity and dreariness and absurd economic slavery of their current reality is overthrown and surpassed in favor of a new world of greater joy, creativity, cooperation among us one with the other, and beloved, heartfelt community. The idea of socialism as a mere “economic system” is a legacy of the old thinking emerging from the Enlightenment four hundred years ago, in which the spiritual dimension of our common existence was decisively eclipsed in favor of science, fact-centered objectivity, and Reason understood as detached rational thought directed at satisfying mere material needs. Both Darwin with his emphasis on mere “survival’ of the organism as the centerpiece of evolution, and Marx with his emphasis on history as a struggle between classes over the means of material existence were embodiments of this old way of thought. When the universality of the longings of the soul were rejected and instead relegated to being a mere matter of “personal belief” to be indulged in in private, we humans (temporarily) threw out the baby with the bathwater—in our effort to overcome the legacy of religious persecution and the abuse of spiritual claims to knowledge about the world, we obscured for hundreds of years the essential longing of all of us to live in a loving world of mutual presence and care and (temporarily) embraced the idea what “we” want is simply the individual satisfaction of material needs. This fear-saturated social reality, this rotation of mutual anonymity, can only be overcome by creating a new world of trust and care and authentic mutual recognition, but the creation of such a world must take account of the legacy of mutual fear out of which it is being born. That legacy of fear is very powerful and will not easily surrender itself to aspirations born of the loving impulse toward connection, because from the standpoint of each person’s isolation, everyone is afraid of being duped, taken advantage of, humiliated, rejected. People today are so conditioned to exist in separation and fear of the other that they would rather die in a nuclear war than let down their guard by mistake and face a devastating humiliation and rejection by the other…thus today we have wars raging all across the globe, and the accumulated fear of the other that has given rise to these wars supports itself through inflated nationalisms and other forms of pseudo- or imaginary community that act as a defense against seeing the other as One of Us, as the same as we are. We are conditioned across many generations to see the other as a Threat rather than as the source of our completion. So the new world that we all want, and that today hundreds of thousands of young people are coming out into public to support, must be born in the very process of healing this enveloping legacy of fear: the new socialism must be a spiritual socialism that fosters confidence in our capacity for empathy, compassion, and mutual sight, and that gradually leads each person to feel safe that if we let down our guard, the other person, the person next to us, the person across from us, will remain out there with us, will join us in a new space of increasingly spontaneous trust and affirming co-existence. The work of achieving this new world requires incorporating a spiritual component into our activism, so that our mistrust and fear of the other can be “thawed out” in the face of practices that enable us to get used to residing in each other’s beloved presence, in the simple grace of each other’s existence. This spiritualization requires incorporating but also going beyond the economic manifestations of socialism—incorporating but also going beyond universal health care, free college for each new generation, worthwhile work for truly living wages. And it also requires incorporating but going beyond the important step of linking democracy and socialism, as Democratic Socialists of America has done, since mere democracy cannot create a safe social space of mutuality if it remains a democracy of strangers saturated with the fear of the other that has conditioned us and made us strangers in the first place. 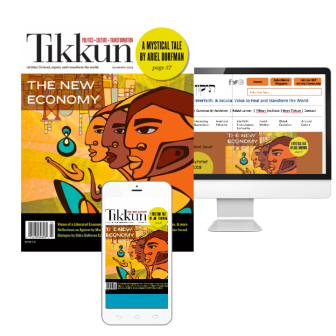 Rather these essential economic and political dimensions of the new socialist movement being born today must be supported by a new social-spiritual dimension linking the nurturing of spiritual community with socialism, so that the transformation of the economy in a more cooperative and egalitarian direction, and the transformation of political life in a more democratic direction, is accompanied by a healing of the legacy of separation and fear of the other that has so far undermined our radical and visionary social efforts. How we accomplish this spiritual transformation of the space between us, this spiritual transformation of the living interhuman field, will be the subject of Spiritualizing Socialism, Part II.